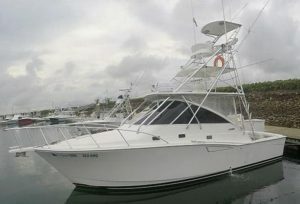 This 35ft Cabo Express powered by twin Cat diesel engines charters out of Pez Vela Marina in Quepos. Experienced Captain ‘Chirrasqui’ is at the helm, assisted by an English-speaking crew. She features an A/C cabin and bridge; staterooms; galley; full marine head with shower; a battle saddle and outriggers: Live well/tuna tubes; electric reels for dredges; a complete range of tournament-class conventional light and heavy tackle; marine radio; a complete range of electronics including GPS and fishfinder; Bluetooth stereo; and all the required safety equipment with life raft.